I am writing to you at the request of Senator Rand Paul, who suggested that I apologize to you for investigating your offshore tax planning. I should note at the outset that I wasn’t sure how to address this letter. Mr. Paul said to apologize to Apple, but I’m not sure if Apple is a person, and if so if you are a boy or a girl. I thought you were a company, but after hearing Mr. Paul tell the story of how you recovered from near death in the 1990s, maybe you are some kind of superhero. I’m also not really sure where you live. You have an address in California, but your tax returns also claim residency in Ireland, except not really. So I hope this letter gets to you. I have to say, the whole Ireland thing kind of sounded like a scam. I was relieved when your CEO, Timothy Cook, explained that you don’t use any tax gimmicks. A professor testifying at the hearing yesterday said that he nearly fell off his chair when he read Mr. Cook’s statement, but that’s probably because tax professors are known for being silly and theatrical. You should see what their conferences are like. So, I apologize. In order to improve our service to you in the future, we are implementing two new changes in our customer service policy. The first is a promise to do a better job of scheduling. If we have to mention taxes again, I’ll be sure to just add it to the agenda when your lobbyists drop by for a closed-door meeting. And I don’t mean to badger you, but Google and Microsoft spend a lot more money on lobbying, and we do offer special treatment for regular donors. The second is a promise to stop holding Congressional tax investigations. The IRS never has enough to do, and they are pretty entrepreneurial. I’m sure they are competent to handle all of this on their own without our help or oversight. Finally, I want to emphasize just how much we appreciate your willingness to comply with your legal obligation to pay taxes. If you think about it, taxes are really just a form of charitable giving. Our goal is to reach a high level of participation from both American and Irish corporations, and your donation in any amount makes a difference. We also welcome any in-kind donations in the form of iPhones and iPads. My daughter knows how to use them. I hope you can forgive us. In hindsight, we were cavalier in our efforts to find out more about how our tax system is or isn’t working. We know now that it’s not really any of our business, and promise to base any future tax legislation on naïve intuition and wild rhetoric instead of facts. P.S. At your earliest convenience, please let us know what stance we should take on immigration policy. * This gift may or may not be tax-deductible. Please consult your tax advisor. 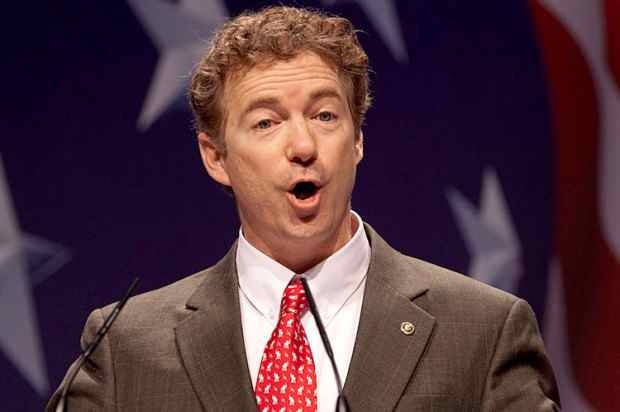 Senator Rand Paul's Fight for Offshore Tax Havens.